Patric Standford wrote in a wide variety of forms, from large-scale orchestral and choral music to a cappella, chamber and instrumental pieces. While teaching at the Guildhall School of Music in London he won several major international composition prizes. The First Symphony, each movement of which is named after a season, grew from a string piece conceived as a memorial for the conductor Sir John Barbirolli. Dedicated to and premi�red by the soloist on this recording, Raphael Wallfisch, the powerful Cello Concerto is built around a theme from the fifth movement, Ihr habt nun Traurigkeit (You now are sorrowful) of Brahms� German Requiem. This is another in the series of previously issued discs on the British Music Society label. This one is ex-BMS441CD, and Naxos is now issuing them on its label. Standford died in 2014 and much of his music is unrecorded. He was an important figure in British music, chairman of the Composers� Guild of Great Britain. 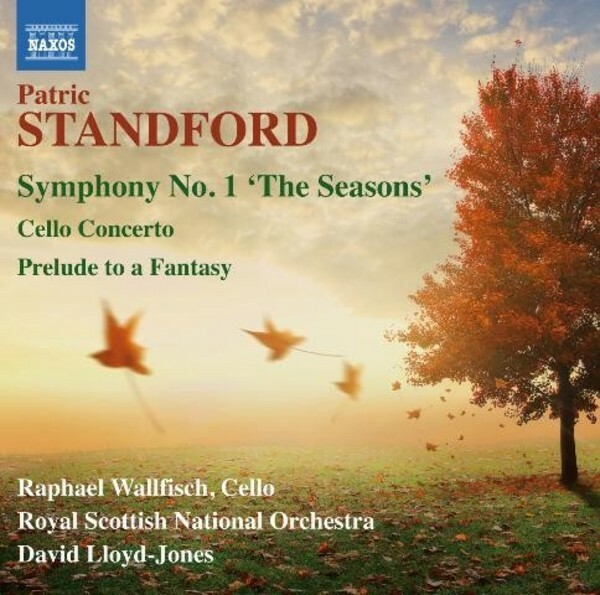 On its original appearance, the disc received favourable reviews: �Standford�s music has been extremely well served by the Royal Scottish National Orchestra and that doughty champion of unfamiliar British music, David Lloyd-Jones. The sound quality is extremely good.� (MusicWeb International).